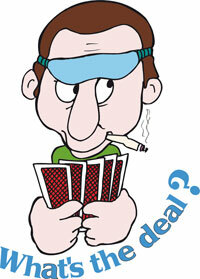 It is generally accepted among bridge players that one should not deceive one’s partner. However, from time to time situations arise that just beg to be taken advantage of, where the risk of fooling partner is overridden by the potential gain if the opponents are similarly misled. Such was the case with this month’s deal played at the Lake Chapala Duplicate Bridge Club in Riberas. East and South both passed and when it was West’s turn he figured that North would probably have a worthwhile collection so it was time for a little “outside-the-box” thinking. Although he only held 10 high card points, he felt that it was necessary to stir things up a bit by purporting to have some strength. The favourable vulnerability certainly helped spur him to action. Although his partnership usually only opened 5 card majors and his first inclination was to bid 1 diamond, he felt that this would not interfere sufficiently with his opponents’ progress to finding their best fit. Therefore he started the proceedings by bidding 1 spade, at the same time planning to tell his partner that he had a club mixed in with his spades should a post-deal discussion arise. This turned out to have a significant effect on the opponent’s strategy. North had been planning to open 1 no trump if there had been three passes to him but with West’s foray into the auction he had his intentions derailed. As North did not hold a spade stopper, he could not overcall 1 no trump so he took the next best action by making a takeout double. East was equally in the dark concerning her partner’s subterfuge so she innocently made the standard raise to 2 spades. This temporarily took South off the hook and he passed, as did West so the bidding came back to North who doubled again, showing a more than minimum hand and once more requesting South to show his best suit. East passed and South bid 3 clubs which finished the auction. West led the spade ace (ace from ace-king) and East played the two showing an odd number of cards. West continued with the spade king and then paused to consider his next move. If East had any club tricks coming to her, they could not go away so it looked like diamonds was the best possibility of gaining extra tricks. With this in mind, West led his fourth-best diamond 7 to East’s ace and when she returned the suit West scored his king for the last trick for the defense, holding the declarer to 9 tricks for a duplicate score of 110 match points. When the game had ended and the scores were posted, it turned out that at every other table the contract had been 1 no trump by North making precisely 8 tricks for a match point score of 120 match points. So West’s ploy had been an outstanding success as he had gained a complete “top” for his side by undertaking a little deception at the right time. And he didn’t have to even explain his lack of a fifth spade to his partner!